The Blu Plus+ Slide is one of a tight selection of cig-alikes and vape pen kits mainly targeting the new user crowd. Blu e cigs do a good job of providing products that can pretty much just be picked up and vaped out of the box. And that rings true for the Blu Pus+ E Cig kit that we are reviewing today. The kit comes with few working parts and is super easy to get up and running with. The battery that is supplied with the kit is 150 mAh rating. It is pretty much the nearest thing available at the moment in terms of being close to the size of a cigarette. That’s not to say it’s the same size as it is slightly bigger. In the hand it feels good with a smooth finish and the branding is good without being to in your face. The quality is very good. The case that comes with the Blu Plus+ Slide kit is something I haven’t seen before. Not to be mistaken with the Blu Plus+ Charge kit, this case is simply design for carrying your e cig gear. The case is made from rubber and has a super soft finish on the outside making it easy to ‘slide’ in and out of your pocket. In practice this really works well. It’s slim enough to carry around without being intrusive and the bonus is that you can carry one full e cig, one replacement refill cartridge and the USB charger. There is a window to the front and back of the case and a hole the same circumference of the e cig at the top. A nice little deign feature that allows you to slide your e cig up through the whole when you want to vape. No need to open the case and no need to remove the e cig. When done vaping you simply slide the e cig back down into the case by gripping the e cig through the windows. As mentioned, very simple design but it is very effective. 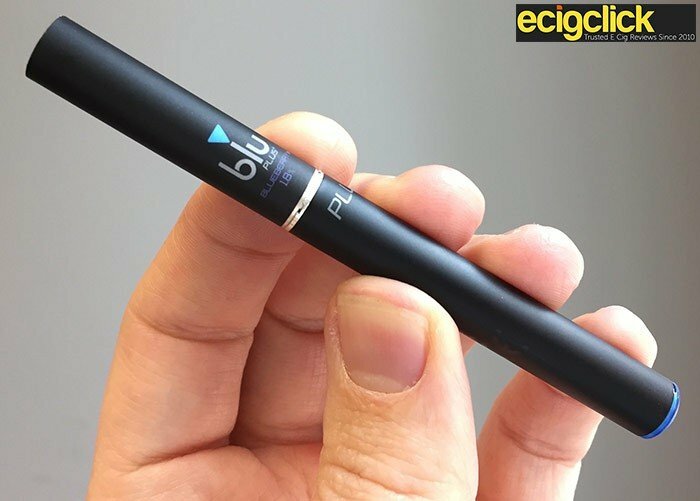 How Does The Blu E Cig Plus+ perform? Setting up the Blu E Cig is a simple affair, take your battery and refill cartridge and screw together. Your ready to go. Now if you are a new vaper making the switch from smoking I will say straight from the off that battery life with this (and all) cig a like e cigs is not the best. It is the nature of the beast when it comes to the small e cigarettes. So just keep that in mind, if you are a heavy smoker you could be re-charging every hour or two. With that in mind I always advise with these type of kits to buy spare/back up batteries. In fact it’s a must do! The battery takes around 3 hours to charge using the USB charger in a USB port. So spare batteries allow you to rotate. Also, if you are out and can’t get to a charging point and your battery dies what are you going to do? Pre-empt these kind of issues and it will make your transition to vaping much, much smoother. Don’t expect to have all day, uninterrupted vaping with a single battery. Blu do also have another option in the the Blu Plus+ Charge kit that comes with a case that charges your batteries. How Do You Know When The Blu+ Battery needs Charging? The light on the tip of the battery will flash and you won’t be able to draw any vapour. It’s a sudden thing so you won’t get any warning it’s about to happen. Again, the standard with e cig batteries but just be prepared. The Blu Plus refill cartridges with this kit came in a Tobacco e liquid flavour. They are in a sealed 2 pack box. There are 4 other flavour options available to buy separately, Menthol, Cherry, Blueberry and Strawberry Mint. They are available in various strengths. All cartridges are labelled with the flavour and nicotine strength so no mistaking what you are vaping. I’m not the biggest tobacco flavour fan, definitely wouldn’t be my first choice in any of my vapes. So I wasn’t a huge fan of this e juice. It does have that dry tobacco flavour, almost a touch on the bitter side. Is it similar to real tobacco? I would say, as a vaper it is close. As a smoker though (which I haven’t done for 6 years) it may be a different story, especially if you are coming straight from the cigs. One thing I would also say if you are making the switch. Don’t expect to get an exact tobacco flavour reproduced in vape form. You have to give flavours time, it’s surprising how quickly you can come around to a flavour which you may not like in the first instance. Try not to compare too much and write things off, vaping is about adapting. It isn’t smoking, it’s an effective alternative. I started on tobacco flavours in 2009 but soon moved away from these into fruit e juice flavours. The latter is really what kept me off the cigarettes. Since then I am really enjoying my dessert flavoured e liquid as well. Of course this is just my personal experience, yours will be different. This is actually a really refreshing flavour. For me though the mint is the overriding flavour with the strawberry just hinting in the background and slightly more prominent on the exhale. Not a fresh strawberry taste, more of a sweet strawberry. I personally would of liked more strawberry in this mix though. The Blueberry is not as punchy as other blueberry flavours I have tried but it does give a nice subtle flavour that lingers in the mouth. I like cherry flavours and have tried many in cartomizer form in the past but this is slightly different. The Blu Plus cherry is more like the cherry lips sweets from back in the day. On the inhale you get a sweet cherry and on the exhale there is a slight floral note that hits right at the end. I never liked cherry lips but if you did then this flavour could be worth a try. The vapour volume for all flavours was actually decent for a cig-a-like with the throat hit being on the smoother side. One refill lasted me most of a day so definitely a plus point. The quality of the e cig is good and has a good feel in the hand. The soft touch slide case is a great addition allowing you to easily carry around your e cig slipping it in and out of your pocket with ease. The flavours on a whole hold their own against other refill cartomizers I have tried and the cartridges themselves last a good amount of time. It’s also very easy for new users to just pick up and use out of the box. The obvious down side is the battery life but this isn’t a surprise as most cig-a-likes are not the best on this front and a second or third spare is recommended if you choose this e cig for the long term. For me, I won’t be using Blu e cigs after this review. But that is because I have moved onto bigger, more advanced vape mods a long time ago. If, however, you are new to vaping and want the familiarity of a small e cig then this is as good a choice as any. Many new vapers do find they may start on cig-a-likes but then move onto to refillable vape pens where they have more choices for flavour and longer battery life. Some go straight to vape pens from the start. At the end of the day it’s about finding the right solution for you and the Blu E Cig plus+ slide kit will give you a taster of vaping for a very reasonable price. The only thing I will say is if you are a heavy smoker you may want to consider starting on a vape pen for improved battery life. What Type Of E Cig Should I Buy? The Blu E Cig plus is of course not going to be for everyone. If you do have your mind set on a cig-a-like e cigarette then this is a good option.